Alright, so this is my last post in 2017, not my previous one haha! However you’re celebrating the end of 2017 tonight, have a great time and stay safe! So… how lucky was I that this skirt was on sale when I spotted it! I mean… isn’t it great? That white pleated insert is just so unique! It definitely makes my ‘special pieces in my closet’ list. That insert makes it so interesting, and whether I dress it up or down, this skirt will stand out in the crowd. I can never help myself when it comes to unique pieces like this, because I know that even as the years go by, I will still enjoy pulling them out of my closet and wearing them. Here, I opted for a muted color palette and a more dressed up look, but if I added a cool pair of sneakers (in a bright color) I would make it look more casual and street-like. As I am typing this, I am making a mental note to self to wear it again in the spring and summer with a crisp white T-shirt and my red Puma sneakers for a more everyday look. Wearing: Y.A.S. 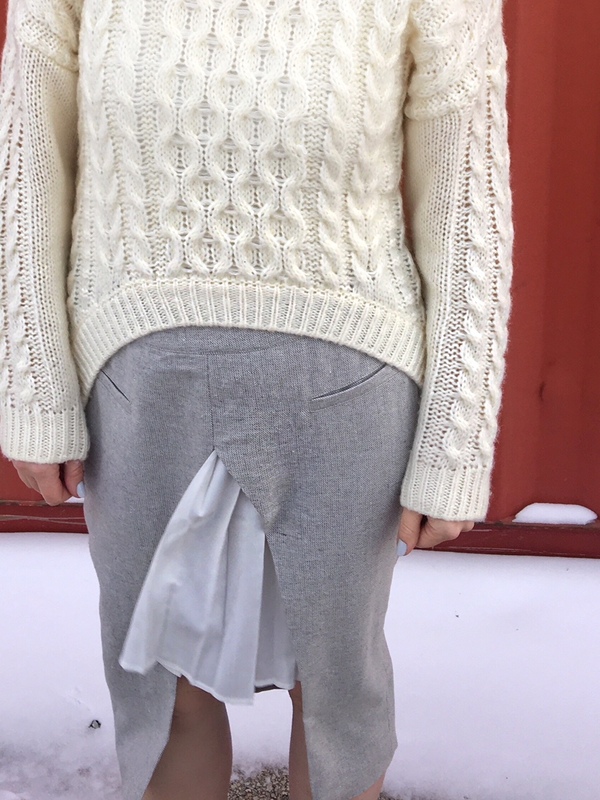 skirt on Asos.com (hurry! It’s low in stock! ); Nasty Gal white sweater (old, very similar here); Gap trench coat (very old, similar here and here); Chloe Susanna ankle boots (in black here). "Some army green & some blue"
Love the skirt. It looks longer on you (which I prefer) than on the site. May I ask how tall you are and what size you purchased? Thanks Monika! I'm about 5.6. They have only L available. I'm going to order it now and hope the length is closer to what it looks like on you!Happy New Year! That sounds great. The length should work then and hopefully the L size fits you as well. Happy New Year!